Bags of cement, a heap of sand, stacks of bricks and two plastered walls describes the status of half built home of Suleman Nesha. She received thirty seven thousand rupees as first instalment under Indira Awaas Yojna and began giving shape to her dreams of a ‘pucca’ house. The construction work could have continued smoothly if she would have received second instalment also. She used all the money from her account for the construction work, unfortunately after three months the work stopped as she did not receive the second instalment on time and her wait began. 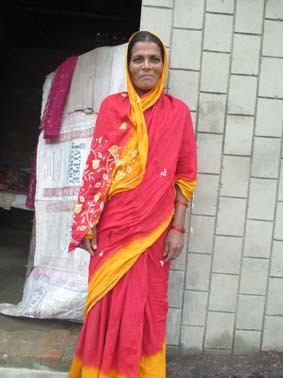 Suleman Nesha is 48-yr-old woman and lives in Jharjhari village of Inerwa block in West Champaran. She has been planning to make a house of mortar and shell so that her family can escape the troubles experienced while staying in a thatched house. She has a big family consisting of eight children and a husband. Four daughters are married and her elder son married a year earlier. The family however managed to accommodate themselves within a room but they always felt the need to have a good house. And through Indira Awas Yojna their wishes were about to get fulfilled, but the gridlock shattered their happiness. Jahir Miyan (54), husband of Suleman Nesha asked some of his friends within the village to find out solutions of his problem but no one could give him answers. One fine day he discovered about Soochna Seva and the good work done by the team. He waited desperately for the camp that was scheduled to take place in Jharjhari villag the next day with the hope of receiving some help from them. On June 25, 2015, Soochna Seva team organised a camp for filling the form for ‘Jeevan Jyoti Beema’ for interested people. The couple spoke with the team and discussed their problem and requested them to sort it out. The team examined the documents and found that the papers were alright; hence Suleman Nesha is eligible for next instalment also. Therefore the team went to Block Development Office (BDO) to know about the delay. The officer at BDO went through the documents and notified them that there has been shortage of funds so the money did not go in Suleman Nehsa’s account. Three days later, the second instalment also came and the construction work resumed. Soochna Seva team received gratitude not only from the family but also from the locals for the selfless efforts put in by them.